Zveno (Russian: Звено, Chain link or a military unit "Flight") was a parasite aircraft concept developed in the Soviet Union during the 1930s. It consisted of a Tupolev TB-1 or a Tupolev TB-3 heavy bomber acting as a mothership for between two and five fighters. Depending on the Zveno variant, the fighters either launched with the mothership or docked in flight, and they could refuel from the bomber. 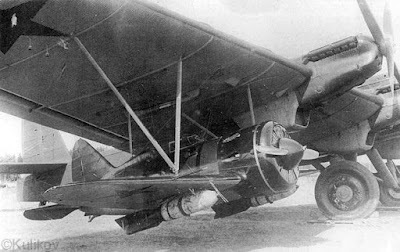 The definitive Zveno-SPB using a TB-3 and two Polikarpov I-16s, each armed with two 250 kg (550 lb) bombs, was used operationally with good results against strategic targets in Romania during the opening stages of the German-Soviet War. The same squadron afterwards also carried out a tactical attack against a bridge over the River Dnieper that had been captured by advancing German forces. In 1938, Vakhmistrov devised Zveno-SPB (SPB: Sostavnoi Pikiruyuschiy Bombardirovschik, Combined Dive Bomber) which consisted of a Tupolev TB-3-4AM-34FRN mothership and two Polikarpov I-16 Type 5 fighters. Each of the fighters was armed with a pair of 250 kg FAB-250 high-explosive bombs. Although an I-16 Type 5 could get airborne on its own with no more than 100 kg of bombs, once hoisted in the air by the TB-3 it could reach 410 km/h at 2500 m, had a service ceiling of 6800 m, and could dive at up to 650 km/h. Once the bombs were dropped, the SPB-launched I-16s performed like conventional Type 5s. The three-aircraft Zveno-SPB had a total takeoff weight of 22000 kg, a top speed of 268 km/h and a range of 2500 km. The use of a mothership increased the range of the I-16s by 80%. The SPB first flew in July 1937, with TB-3 piloted by Stefanovskiy, and I-16s piloted by Nikolayev and Taborovskiy. Following the successful test program in 1938, Zveno-SPB was accepted into service. By 1 February 1940, Soviet Air Force was supposed to receive 20 TB-3s and 40 I-16s, with the same number going to the Soviet Navy. 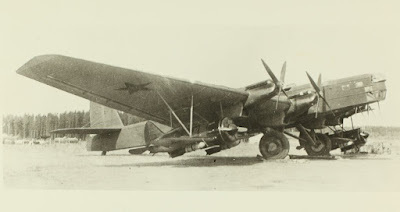 Vakhmistrov was also asked to investigate the possibility of using Tupolev TB-7, Tupolev MTB-2, and GST (PBY Catalina) as the motherships, as well as arming I-16s with 500 kg bombs. By 1939, the government support for the project had waned, the Navy canceled all of its orders, and the Air Force reduced the number of fighters from 40 to 12. However, Soviet military observers noted the success of the Luftwaffe Junkers Ju 87 dive bombers in the opening stages of World War II. 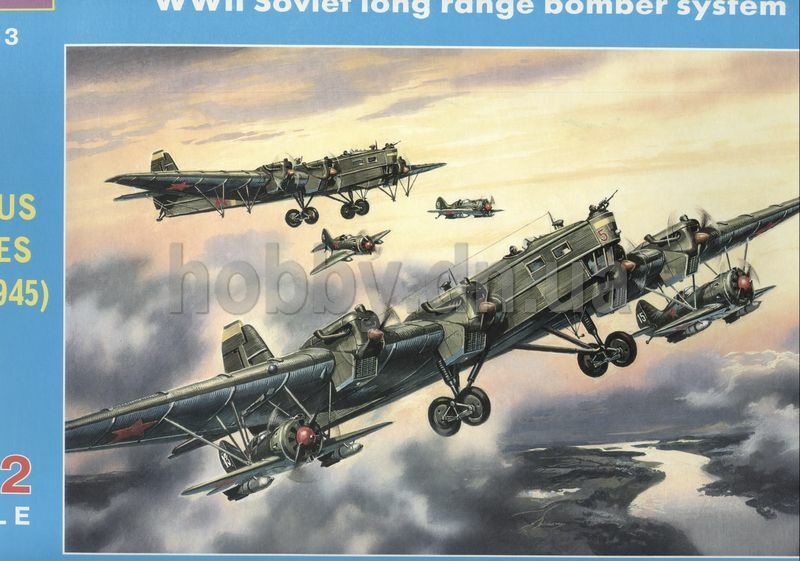 As the Soviet Union had no dive bombers, it was decided to resume low-scale work on the Zveno-SPB. Testing of the first production Zveno began in June 1940. It differed from the prototype in using the much more powerful I-16 Type 24 fighters. A total of six mothership-fighter combinations (six TB-3s and twelve modified I-16 Type 24s) were completed. All were attached to the 2nd Special Squadron of the 32nd IAP (Fighter Regiment) of the 62nd Aviation Brigade of the Black Sea Fleet Air Force stationed in Eupatoria(Crimea). Mirroring the nickname of the Zveno experiments, the squadron was dubbed Shubikov's Circus (Цирк Шубикова) after its commander Arseniy Shubikov. Zveno-SPB saw limited but successful combat use during the German-Soviet War. In the opening stages, the Black Sea Fleet Air Force was tasked with destroying industrial targets in Nazi Germany-allied Romania. The most important of these was the King Carol I Bridge over Danube which carried the Ploieşti-Constanţa oil pipeline. After several failed attempts to destroy the heavily protected bridge with conventional bombers, the task was given to the Zveno squadron. As a combat test, it was decided to first attack the Constanţa oil depot. On 26 July 1941, two Zveno-SPB aircraft performed a successful attack on the depot in broad daylight with no losses. The fighters disconnected 40 km from the target and returned to the home airfield under their own power. The first of the two bridge raids took place on 10 August 1941. For this mission, the I-16s were fitted with additional 95-liter underwing fuel tanks for an additional 35 minutes of flight time. Of the three Zveno-SPBs, one had to turn back due to mechanical problems. The other two launched their fighters 15 km from the Romanian coastline. The fighters successfully dive-bombed from the altitude of 1800 m and returned home with no losses despite heavy anti-aircraft fire. The second raid took place on 13 August 1941. This time, all three Zveno-SPBs reached the target. The six fighters scored five direct hits on the bridge and completely destroyed one of the spans. On the way back, the fighters strafed Romanian infantry near Sulina and returned to Eupatoria with no losses. Following the successful sorties, two additional Zveno-SPB were brought to operational status, bringing the total to five. The main limiting factor was the lack of high-output Mikulin AM-34FRN engines, as the other versions were not powerful enough to get the aircraft airborne. On 16 August 1941, Admiral Kuznetsov asked Joseph Stalin for additional AM-34FRN-engined TB-3s from the Air Force so they could be converted to Zveno-SPB carriers, but the request was denied as the Air Force had suffered heavy losses in the opening days of the war. In the meantime, the five aircraft continued flying operational sorties, destroying a dry dock in Constanţa on 17 August and a bridge across the Dnieper River on 28 August, losing one I-16 in the process. During the repeat attack the next day, four Zveno-launched I-16s engaged several Messerschmitt Bf 109s, shooting down two. 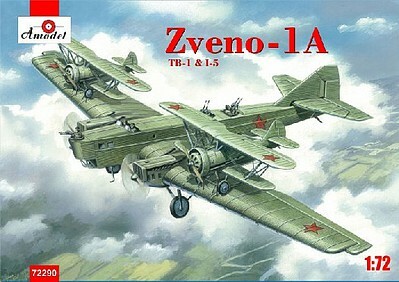 Despite the high success rate, Zveno missions ended by 1942 due to high vulnerability of the obsolete TB-3s and I-16s in the face of enemy air superiority. It is estimated that Zveno-SPB flew at least 30 combat missions. 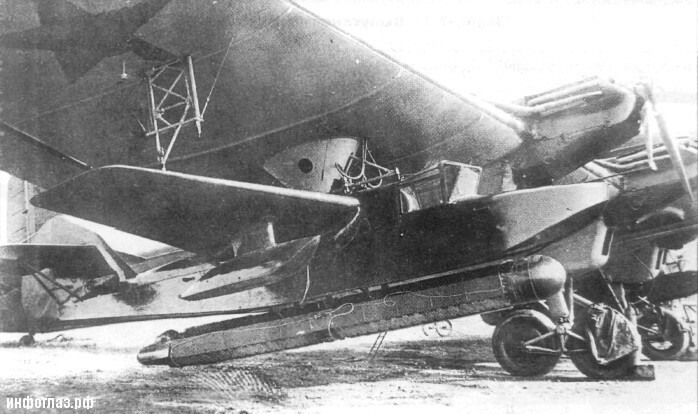 The first successful flight of Zveno-1, using a Tupolev TB-1 mothership and two Tupolev I-4 fighters mounted on top of the wings, took place on 3 December 1931. An error in the sequence of opening the latches by the bomber crew resulted in one of the fighters prematurely separating, but the TB-1 with an I-4 attached to one of the wings remained in controlled flight and the second fighter was soon uneventfully deployed. After latch control was fully moved into the fighters, the normal launch procedure consisted of pilots opening the tail lock and then pulling on the control stick to open the front locks and separate from the bomber. As predicted, the presence of docked fighters had a minimal impact on performance of the mothership, and Zveno-2 Tupolev TB-3 carrying three Polikarpov I-5 fighters handled the same as an ordinary bomber. To mount the aircraft on the wings, they were pushed up special ramps but the centerline aircraft had to be lifted on top of the fuselage by hand. This was so cumbersome that the centerline I-5 became a permanent fixture on top of the Zveno-2 TB-3 and never started in the air. At one point, the centerline I-5, still with a pilot at the controls to operate the engine, had the wings and the tail surfaces removed and was used purely as fifth powerplant for the bomber mothership. The Zveno-3 in which TB-3 carried two Grigorovich I-Z fighters under the wings presented a different challenge — the I-Z was a monoplane with fixed landing gear which touched the ground while it was suspended under the mothership. To accommodate the uneven ground during takeoffs, the fighters were attached via a floating frame that permitted vertical movement relative to the TB-3. However, immediately after takeoff the I-Z pilots had to push forward on the control sticks to lock the frame in the fixed bottom position — if the fighter-bomber was not rigid in flight, the bomber became extremely difficult to control. During one of the test flights, I-Z pilot Korotkov incorrectly timed the locking maneuver and the lift generated by his fighter broke the docking frame and crashed him into the bottom of the mothership's wing. As the bomber came in for an emergency landing with both fighters still attached, the slow landing speed of the TB-3 resulted in loss of lift for the I-Z which fell away, killing Korotkov. This was the most serious accident of the entire Zveno program despite the inherent complexity of carrying as many as five aircraft, performing mid-air launches and dockings, and damage to the motherships by propellers and landing gear of the fighters. Tests with various combinations of aircraft determined that top-mounted configurations presented the most difficulty in docking due to turbulent airflow coming off the mothership's wings. The problem of safe underwing attachment was solved with the appearance of the Polikarpov I-16 fighter with retractable landing gear. This permitted the use of the same rigid mounting frames as for the top-mounted aircraft. The mothership and its fighters were unofficially nicknamed the Vakhmistrov's Circus (Цирк Вахмистрова).